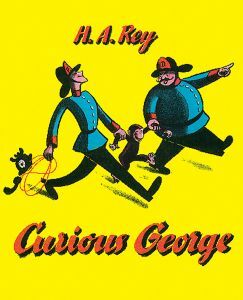 Revisiting the original book about everyone’s favorite chimpanzee, Curious George by Margret and H.A. Ray, I was surprised by some of the details I’d forgotten as a child. Of course, The Man with the Yellow Hat baits and captures George, removing him from his African homeland and ultimately placing him in a zoo — there’s that. But there is also the bit where George smokes a pipe and another part where George is placed in prison. A related note: There was a lot of controversy surrounding the release of the Curious George movie several years ago. What did you think? I’ve yet to see it, but kiddo and I love Jack Johnson’s soundtrack. My son loves Curious George, both the animated movie with Will Farrell and the PBS show. I too had forgotten the details in the original book! We recently got the read along version for him from B&N and I was horrified. There are several things that are definitely not appropriatefor or easy to explain to a 3-year old! In the movie, the only bad thing that happens is at one point the man decides he can’t properly care for a monkey and calls animal control to have him taken away. They capture him and put him in a cage, then he’s loaded onto a ship to go back to Africa. This part could be a bit scary for small children, but the man ultimately comes and rescues him. He looks quite lonely and upset, but is never roughed up or hurt. As for how they come to be together, in the movie version it is actually a happy story. George doesn’t have a family like the other animal babies do. He meets the man, they play together, then George follows the man back onto the boat when he leaves to come back to the US. My kids and I love these books. Such great fun! 1. CG finds a rabbit hutch in a backyard where there is clearly a call for some spay/neuter action. 2. CG goes to space in a rocket. This was the hardest one for me to swallow, knowing the history of our nation’s relationship with the chimpanzees who participated in the space program. 3. CG goes out fishing (fortunately unsuccessful). It was a sweet gift but made me laugh because the plots of the books needed some countering! When I read this for the first time to my daughter, I quickly tossed it in the recycle bin. At face value, it’s not how I want to teach my children to treat animals. But looking deeper, it seems to resemble the slave trade. It’s sad because that mischievous monkey is a lot of fun. Jenn, your comment raises a valuable point: Sometimes what we find objectionable in a book can be used to spark discussion, particularly with older kids. I’m not sure my kiddo is quite there yet. At 6, she takes everything at face value, making it difficult where a book uses irony, analogy, or other literary devices (like you suggest might be going on with Curious George). Then again, there are some books that are not worth the bother, no matter the age of the reader — in my book, for example, Good Night, Gorilla falls squarely in that category. Thanks for your thought-provoking comment. I thought the recent Curious George movies were terrible. Okay, I actually didn’t get through them because I get really annoyed when Hollywood has to put a love story in every kid’s movie! The PBS Curious George series is GREAT. It has lots of stuff about science and the environment. My daughter’s favorite episode is when they make compost (episode title: Mulch Ado About Nothing). For that, I can forgive the fact that monkeys need to be in the zoo!